Accessit Library is a web-based library management system for schools which enables the recording and searching of all teaching resources, including video and audio content, e-books, digital documents, and subscriptions. The platform offers Z39.50 cataloguing, intelligent search, engaging dashboards, integrations with existing IT systems, and more. With Accessit Library, teachers and students can search the library catalog from any internet-enabled device, with native apps available for Android and iOS. Intelligent search recognizes truncations and misspellings to ensure that users can find what they are looking for, and simultaneous multi-provider search lets users discover information on local physical and electronic resources as well as search across Britannica, Gale, and many other sites. Accessit Library allows teachers to access and manage teaching resources in a range of formats, create reading lists, and deliver electronic documents and moderated online content to students. Each student has their own library account, through which they can check item availability, reserve and renew items, read and write reviews, track their on loan and overdue items, and create citations. Accessit Library also offers a range of management and financial reports to provide principals and administrators with insight into how their library and learning resources are being used school-wide. When we needed a new library management system the standout product that my local librarians raved about was Access-It. I've used a large number of different databases throughout my 24-year library career, mostly in tertiary and public libraries, so I'm a very confident and experienced user and expect a lot from any system. We've been using Access-It at our school for two years now and it continually delivers a fantastic user-friendly system with support and training second to none. That is incredibly important when most school librarians are usually in a sole position and have little time to muck around with a system that does not work well. Access-It saves time and delivers at every level. Stocktaking is a breeze. Updating records and cataloging is quick and easy. You can load bibliographic records, videos, websites, pdf's...we even use it for our board game collections. I'm currently creating an archive of e-documents about our WW1 old boys which the students will also contribute information towards. Very exciting! It works seamlessly with our Kamar student management system, and OneSearch has made it so much easier for our students to get access to subject databases and learning resources. However, the thing I like best about Access-It is that they are continuously developing their system so that it delivers more and keeps up with technology. The changes are always impressive with each upgrade, they really are innovative. Every roadshow I have been to, and we all really look forward to these each year, is a buzz of questions, suggestions, and ideas. I've been to heaps of vendor training sessions over the years and usually they just present what they offer. Access- It do this, but more importantly ask us what else we want, what we don't like and what could be done better - they really like to speak with us and see how things are going - it's so nice to be respected and valued. Better still, so many of the suggestions are acted upon. Along with this are the training and support. They got everything set up for us when we transferred systems, and the training sessions with Cynthia were great. If you're stuck or something is not working for you (it happens) - you can ring the helpdesk or go over their tutorial videos, online support - whatever suits you, you'll get help and advice and get back on track. This really is a great product and I totally recommend any school in investing in it - so many of us have and love it!! Ease of use for both the students and staff and for me as the Librarian. It saves time and delivers and top-of-the-range database, catalog and information resource for our school. Ease of use for both the students and staff and for me as the Librarian. It saves time and delivers and top-of-the-range database, catalog and information resource for our school. It would be great if you could do something on the Action list and once it was sorted, it would take you back to the list, rather than the homepage, but hey, I can live with that! I started working in this library when we were still doing a lot of manual cataloging and Access-it was in its infancy. It has been interesting to watch how it has grown and developed in response to feedback from the library community. Access-it has helped me manage a greater work load with less hours. To be honest, I can't imagine trying to do my job without it!I use Access-it in my primary school library. There are lots of amazing features available but 'automated cataloguing' would have to be the most user-friendly and time saving feature in the programme for me. For the staff (particularly at report time) the teachers love being able to get a detailed report on what their students have been borrowing and reading to discuss with the parents. Our students love searching and using the Webapp, which not only looks attractive, but is easy to update from a management viewpoint. One search is a brilliant feature to offer both students and the staff quick and easy access to reputable websites. I use Access-it in my primary school library. There are lots of amazing features available but 'automated cataloguing' would have to be the most user-friendly and time saving feature in the programme for me. For the staff (particularly at report time) the teachers love being able to get a detailed report on what their students have been borrowing and reading to discuss with the parents. Our students love searching and using the Webapp, which not only looks attractive, but is easy to update from a management viewpoint. One search is a brilliant feature to offer both students and the staff quick and easy access to reputable websites. I have just migrated to Version9 and there are a couple of glitches still to iron out, but the team at Access-it are very responsive to helping solve any problems so I am confident that these minor issues will be sorted shortly. Other than that I am very happy. I have used Accessit Library since about version 4 when it was run with Filemaker Pro on Apple hardware. There have been continual improvements, updates and bug fixing since then. The school switched from Apple computers to PCs running Microsoft Windows when version 5 or 6 was being used, we are now using version 9 and loving it. The annual Roadshow Training is well run and great for networking, learning more about the various features, asking questions, voicing concerns, providing feedback and even suggesting possible improvements. The presenters note down the suggestions and any other concerns people might have. I have seen a number of suggestions from sessions attended come through in the programme. Well done!Ease of use. Originally designed for school libraries and is still working extremely well in that environment. Support is easy to access by phone, email or through the customer portal. The many helpful videos available on how to use the variaus basic and more advanced features of the programme. Ease of use. Originally designed for school libraries and is still working extremely well in that environment. Support is easy to access by phone, email or through the customer portal. The many helpful videos available on how to use the variaus basic and more advanced features of the programme. Cannot think of anything as I really do like using this software. I have been able to make school library cards at the press of a button, book lists that appear on the OPAC and dazzle teachers, showcase students work and scan in collections that are on loan to us so that I can track the books easily. These are just a few of the ways Accessit makes life more simple and allows me to promote the library. This software seems to be capable of almost anything you would like it to do. With support from the Accessit help desk I have learnt to understand how it 'thinks', and enjoy learning about using it in new ways. The ways I already use it are now so much part of my daily practice that I would be lost with out it. This software seems to be capable of almost anything you would like it to do. With support from the Accessit help desk I have learnt to understand how it 'thinks', and enjoy learning about using it in new ways. The ways I already use it are now so much part of my daily practice that I would be lost with out it. I find that it is not instinctual to use at first. You need to know things like to close a window by clicking on the x as there is no back button. Little things like this can hold up exploration until you get used to the way it works. Once you do, you forget it was ever an issue. Our library has been using Access-It Library for the last 4 years and we have found it to be a great product, with prompt and wonderful service. As a bilingual International School in Tokyo, we have a large resource collection, which includes a large Japanese collection as well as a Korean collection and collections in several other languages. Access-It functions easily in all the languages we use, including easy use of the scripts, providing a service we found in none of the other library software systems on the market. I highly recommend the services and product to libraries considering switching to Access-It.Ease of use, languages available that integrate easily with the program, the cloud hosting for a fast and efficient system, the support team. Ease of use, languages available that integrate easily with the program, the cloud hosting for a fast and efficient system, the support team. The functionality for making and printing of labels and barcodes - a little more flexibility for editing and ease of use in this area would be a plus. Contact Accessit for pricing information. • A range of teaching resource types can be cataloged, including physical books, e-books, PDFs and electronic documents, podcasts, videos, multimedia files, and more. • Accessit One Search allows users to simultaneously search physical and electronic resources across a range of online content providers, and intelligent search functionality recognizes any truncations or misspellings within searches. 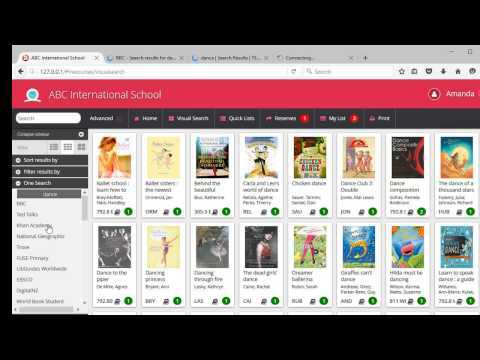 • Students can connect their own devices to Accessit Library to search the catalog from anywhere, and the interface can be configured to engage students. • Recurring day-to-day tasks, such as cataloging, overdues tracking, and notifications by email can be automated to reduce the workload of library staff. • Students can reserve items, renew their loans, check availability, read and write book reviews, create citations, and manage their library account online. Below are some frequently asked questions for Accessit Library. Q. What type of pricing plans does Accessit Library offer? Q. Who are the typical users of Accessit Library? Q. What languages does Accessit Library support? Q. Does Accessit Library support mobile devices? Q. Does Accessit Library offer an API? No, Accessit Library does not have an API available. Q. What other apps does Accessit Library integrate with? Q. What level of support does Accessit Library offer?